A new film by Guillermo del Toro isn’t just a treat, but an event – given that many of his in-development projects have untimely stalled, whether they’re mooted adaptations of At The Mountain of Madness or sequels to Hellboy or Pacific Rim, any completed film that actually reaches cinemas is an occasion in and of itself. However, although the Mexican filmmaker has experienced difficulties with getting his various projects off the ground, whenever he does release a film it’s almost always going to be an extremely satisfying piece of art. Crimson Peak, his latest film, fits nicely into that mould, and is bound to please any lovers of gothic horror or anyone who loves watching grand films like this in general. Positioning itself not so much as a ghost story, rather – as Mia Wasikowska’s young author Edith Cushing puts it – “a story with ghosts in it”, our heroine meets and falls for the charming Baronet Thomas Sharpe (Tom Hiddleston) whose good looks and handsome demeanour means that there’s obviously something wrong with him… and you’d be right, since the film refreshingly makes no secret that there is a suspicious nature about both him and his sister Lucille (Jessica Chastain) early on, although the specifics are kept more under wraps. The unsuspecting Cushing, however, soon finds herself wed to the bachelor, and transported to his and his sister’s dilapidated mansion in Cumberland, England – which is where things really start getting real. One of the great things about del Toro’s visual style is that, no matter what’s in the script, he will go out of his way to make sure that everything is as grand as possible, and Crimson Peak is no exception. There is a high level of gothic theatricality in every single piece of production design, from the costumes to especially the sets (the mansion itself is a stunning piece of work, even in its derelict nature), and the way he uses certain camera shots and Dan Laustsen’s cinematography it is to help create some truly unforgettable imagery that could have easily come straight from a Hammer Horror production. Even better, the director applies this to the several moments of gore and violence which, in the wrong hands, might have looked so grotesque and excessive it wouldn’t have appealed as much, but somehow he finds a way to make even the most disturbing violence look absolutely stunning (the film also features quite possibly one of our favourite murder scenes of the year, where all we’ll say is that it involves a porcelain sink). The promotional material does the film something of a disservice, because it advertises it as more of a straight gothic horror; and while it is indeed that, that’s not entirely what the film is, either. It is also, particularly in the first third, much more of a gothic romance, the type that the Bronte sisters would write about if they were also invested in the supernatural; in fact, throughout this first act, it feels like a mini-film of sorts that seems to go through the basic plot points of a typical turn-of-the-century romance – girl meets handsome and well-off boy, they get together despite the odds – with everything that follows being a much more sinister epilogue. It all works, however, because the craftwork is so well done and the acting very strong – Wasikowska has never been better in our eyes, while Hiddleston and Chastain are superbly slimy and attractive at the same time – which is enough for us to be invested in what’s going on. As for the ghosts themselves, they are further examples of del Toro’s beautifully sinister visual style. Seemingly a mixture of effective make-up, prosthetics and CGI, the spirits take on the form of their mutilated corpses which allows for some seriously monstrous designs and a reminder that when it comes to freaky character outlines, nobody is more adventurous and eager to go the extra mile than del Toro (see also Pan’s Labyrinth and either of the Hellboy movies for further examples). Helping their effective presence is, once more, the craftwork which seems to pay tribute to films like Robert Wise’s The Haunting or even Stanley Kubrick’s The Shining due to the oversized and endlessly gothic nature of the haunted house as depicted in the film. 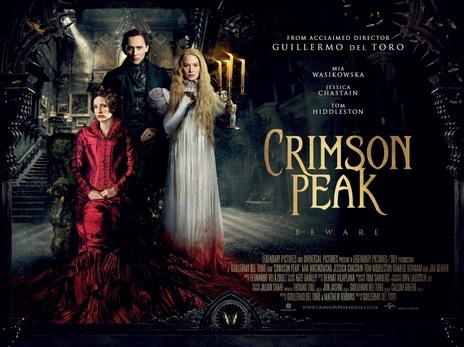 Now, you may have noticed we’ve been throwing about a certain word when describing several things about this film; and while it is true that almost everything is reminiscent of the classic examples of that genre, Crimson Peak is also an endearing love letter to all things gothic. We’re not joking when we suggest that the overall feel is as if one of the Bronte sisters wrote a story in line with the work of Edgar Allan Poe, and that type of pseudo-Victorian sentimentality gave way to the most horrific scenarios of any age. However, don’t go in expecting multiple twists around every corner, because it really isn’t that type of film; del Toro’s aim is to just deliver a considerable amount of scares while making it as handsome a production as is humanly possible. His aim, as is evident with Crimson Peak, is well achieved, and then some. Crimson Peak is an endearing and highly entertaining love letter to gothic romance and horror, helped by Guillermo del Toro’s continuously impressive high standards of production design, strong performances by its cast, and a beautiful visual style that makes even the grimmest imagery look outstanding. It’s destined to be a new favourite amongst fans of the director, and any lovers of all things gothic.